Memorial Ref. : Pier and Face 10 B. 11 B. 12 B.
Ernest Knight was born in about 1892 the son of Edward Knight, a coal miner, and Amelia (nee Roberts) who were living at Top Row, Pye Hill from before 1881 until at least 1915. His father Edward originated from Ramsholt, Suffolk and Ernest’s mother was born in Codnor. Married in 1877, Edward and Amelia had a number of children:- Arthur b. 1879; John b. 1881; Jane b. 1883; Edward b. 1887; Albert b. 1898 and Frank b. 1900. For many years the family lived next door to Amelia’s father – John Roberts who was a colliery deputy and in 1901 Ernest and his brother Edward actually lived next door with their grandfather. Ernest was drafted to France in August 1915 and was wounded shortly afterwards in October 1915. By Christmas 1915 he had returned to the battlefields. 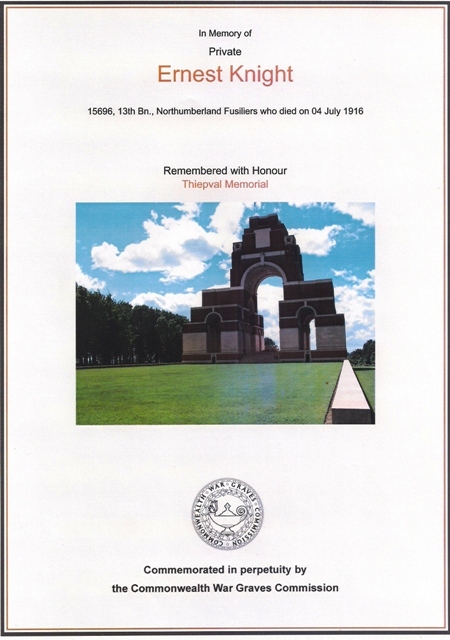 A ‘Free Press’ Newspaper account suggests that Ernest was killed in action on the 1st July 1916, but the Commonwealth War Graves Commission have recorded date of death as Tuesday 4th July 1916. 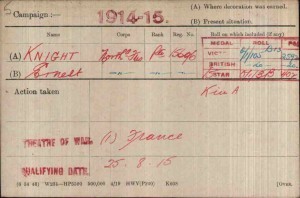 Ernest was awarded the 1914-15 Star, the British War and Victory Medals. Private F. Knight, who is shown on the Jacksdale War Memorial as having served and survived WW1, was Ernest’s younger brother Frank. 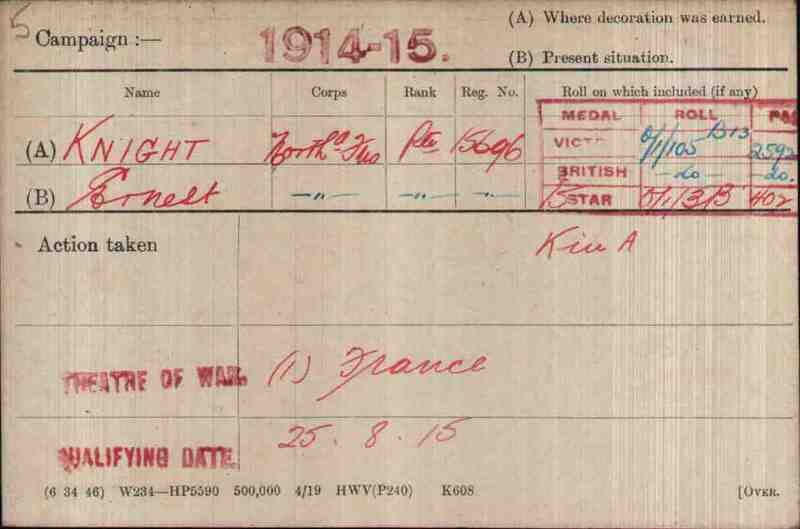 Private Ernest Knight is one of nine Jacksdale & Westwood casualties commemorated at the Thiepval Memorial, France, memorial to 72,000 officers and men of the United Kingdom and South African forces who died in the Somme sector before 20th March 1918, and have no known grave. Northumberland Fusiliers World War One Casualties – 17,005 ( Source: R. Capewell ‘Discovering Military Badges’).